Tomatoes, carrots, swiss chard, peppers still to put up. I don’t have space on our mostly shaded lot in town for a garden. But I do pot tomatoes and this year, also two potatoes and basil and oregano, along with lettuce in the soil. I wonder why I’ve never planted herbs prior to this year. I love, love, love, and use my basil, especially, all the time. You must be extremely busy bringing in the harvest. 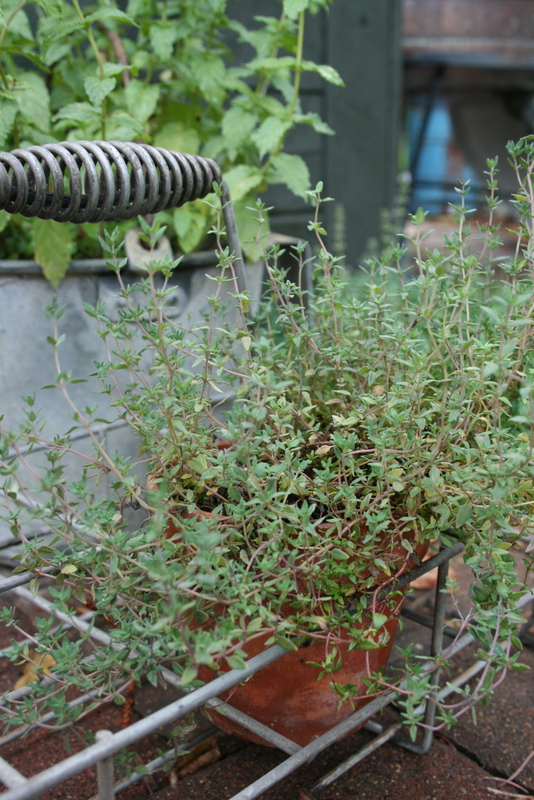 Many herbs work wonderful in pots, but I do recommend putting them in separate pots, not combined together like you see garden centers promoting or magazines showing…use them a lot or just keep them trimmed back…then they don’t get leggy and produce nice healthy, tender leaves to use. Oh, my how I love herbs and could chat all morning about them!!! Have a wonderful weekend Audrey. If you don’t hear from me next week, I might have drowned under a pile of green beans. I’m getting a half-bushel every few days! Years ago I used to visit a sale in the Fall, that was held in a couple of old farm buildings….one of the buildings she hung all her herbs, and flowers to dry from the rafters, and I remember the scent was heavenly–not to mention the sight! The greenhouse is to bright and to hot with all the glass–I need a little farm shed to do my drying….on my wish list! That reminds me, I have herbs to harvest too! No veggies this year because of all my travel, but the farm grew some nice tomatoes and peppers. I have a raid on the veggie patch already scheduled. I used to just air dry my herbs, but started using the dehydrator last year…makes it faster and they retain a nice color. I found some cute jars this Summer that I’m going to use for storing them.